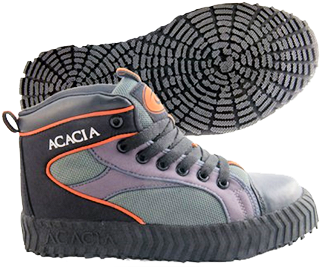 At Taylor Sports, we are offering the Acacia brand of broomball shoes for your ultimate ICE SOCCER experience. The Acadia shoes come in several styles – two are listed below – the Bullet ($95.00) and Blitzen ($85.00) are others currently available. Styles change periodically and size availability may vary with inventory levels. Soles for outdoor ice with some snow cover removed or indoor ice that is said to be medium to heavy "dirty ice". Soles designed primarily smooth indoor ice or indoor ice that is said to be light to medium "dirty ice" — ice covered with shavings from skating usage. Product styling and color variations subject to change. Acacia Broomball is currently working with Taylor Sports to actively help promote ICE SOCCER in supplying Acacia broomball shoes. Please send a check or money order to the address below (payable in U.S. Dollars to Taylor Sports, L.L.C. ), covering the combined price of the shoes, shipping/handling and applicable (Michigan) sales tax. Please specify the size and style for each pair ordered. Shipping & handling costs will vary based on the location (zip code) to which shipped and the number of broomball shoes ordered. Requests for expedited orders will cost more. When an order is placed, you will be advised of the shipping and handling costs. FedEx and United Parcel Service (UPS) are the delivery firms used. A sales tax of 6% applies if this is a retail order shipped to a Michigan address. Michigan municipalities and certain other Michigan entities may have tax exempt status – a letter so stating is required to apply this exemption. The Michigan Department of Treasury (517-636-4730) advises that applicable Michigan Sales Tax applies to both the product being sold and any related shipping and handling charges. U.S. domestic league orders or individual orders for five (5) or more pairs of shoes should be placed directly with Taylor Sports by calling (810) 227-3692. Planned international orders (which require additional shipping price determination) should have total prices verified in advance by e–mailing intended order quantity and "ship to" address. Your order is appreciated and will help ICE SOCCER in its roll-out efforts.